Gwen Conlon was born on April 23, 1924, in Dixon, Illinois to Charles and Loretta (nee Doyle) Conlon. She died Wednesday, January 30, 2019, at Northwest Community Hospital - JourneyCare Hospice in Arlington Heights. 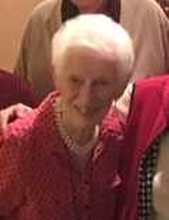 Gwen was a long-time member St. James Catholic Church in Arlington Heights. She is survived by her sister, Lucy (Gene) Jean, her brother Jim (Carol) Conlon; her many nieces and nephews; and her sister-in-law Donna Conlon. She was preceded in death by her parents; her sister, Mary Hemmerick, and her brother, John Doyle Conlon. Visitation from 10:00 am until time of Funeral Mass at 11:00 am, Saturday, February 9, 2019, at St. Edna Catholic Church, 2525 N. Arlington Heights Rd., Arlington Heights, Illinois. Interment private. "Email Address" would like to share the life celebration of Gwendolyn Catherine Conlon. Click on the "link" to go to share a favorite memory or leave a condolence message for the family.